Next Monday my family and I are loading up the van to head from Maine to Rochester, New York, where the Strong National Museum of Play is. It's about a 12 hour drive from here. After reading the rave reviews, I am very excited to take my boys there. 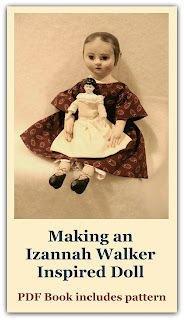 It is thrilling that a place that has 8 Izannah Walker dolls is also a great place to visit with my children and husband! Something for everyone. :-) I'm looking forward to going to the Dancing Wings Butterfly Garden. When I get back, I will write a detailed review of our visit there. In the meantime, if you are within driving distance of one of the museums in the sidebar, or have been to one of them, please send in a review of your visit. If you can't drive to the Strong Museum, you can see the kinds of dolls they have in the book A Celebration of American Dolls from the Collections of the Strong Museum. I own this book and it is a fun one to curl up with at night with a cup of tea. I think it is great that you are sharing your photo's. My family made a special trip to the Strong Museum in the late 80's. At that time they had 11 Izannah's on display. 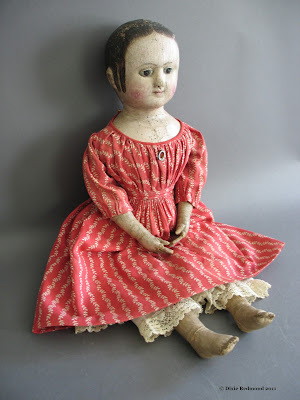 My reason to travel from Ohio and to visit the Museum was to see the Izannah Walker dolls. I called ahead and also found the Museum heplful. At that time my 10 your old son ran ahead to scope out the displays and to find the dolls(his mother's obsessions.) There is something magical about them if they speak to your heart it stays there. I have pictures from that day also, if I have some that you don't have I could forward them to you. Like you I found the Museum to be wonderful and would encourage others to go. All these years later I took my granddaughters to hear Hillary Clinton speak, and my four year old granddaughter went home to tell her mother; Grandma took her to hear Izannah Walker. Still the same obsession. Hi, anonymous! :-) I'm astonished they used to have 11 Izannahs. What happened to 3 of them? Your stories about your son wanting to scope out the displays - the same thing happened to me with my son! If you could forward any pictures you have to me that would be wonderful! I believe Izannah could have run the country given the opportunities that women have today. :-) My e-mail address is in the sidebar where it says "email me". Thanks so much for sharing!